Select the slide that the new slide should come after and then choose Home→New Slide. In the Outline/Slides pane, click the Slides tab. Then click the slide that the new slide should come after and press Enter. In the Outline/Slides pane, click the Outline tab. Click at the beginning of the title of the slide that the new one should come before and then press Enter. If you want a different slide layout when inserting a new slide, click the down arrow under the Home→New Slide button. A palette appears showing various layouts. Click the one you want. 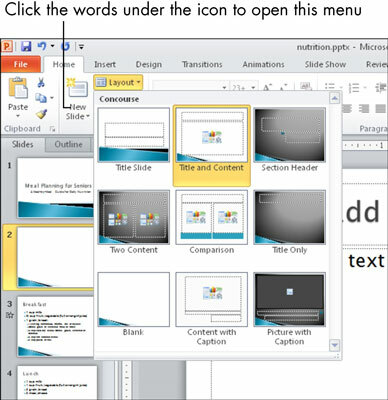 To duplicate an existing slide, including all its content, select it and then choose Duplicate Selected Slides from the New Slide button’s menu.